At this spot where New Golden City sits now, there was once a place called Noodle House. That was the English name, anyway. There might have been a Chinese name that I never knew, but the most defining characteristic of the restaurant was a large framed picture of the geeky, bespectacled owner kneading noodles and smiling as Arnold Schwarzenegger has his arm around him. Noodle House was already gone before the recent Ahnuld scandal. It was gone before he took office as The Governator. But I still remember the food it served. My taste memory is as vivid as ever on it. I can still feel the chew of the noodles in their house spicy seafood noodle soup. We always ordered it because the strands were made right there, in the back. You knew this because to eat there is to hear the constant thwacking: the loud and dull noise of something being hit against something else, as if someone was repeatedly being tortured for information. It may not be a reassuring sound to hear for those who weren't regulars. There was the fact that the kitchen staff seemed to always be yelling at each other. Person-on-person violence would not have been far fetched. But we knew better. We knew it was the sound of noodles being properly made. It was a pity there wasn't a window that showcased it being stretched, pulled, and thrown. That would've ensured its survival. 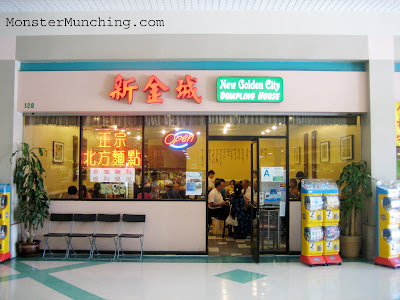 I heard no such sound when I dined at New Golden City, which for those in the know, is loosely connected to Earthen in Hacienda Heights. They both serve the same kind of food. Their onion pancakes are pretty much identical, down to every last, thinly rolled, crisp, buttery layer. Their pork dumplings burst with so much pork broth it almost invites comparison to Din Tai Fung's juicy pork dumplings. 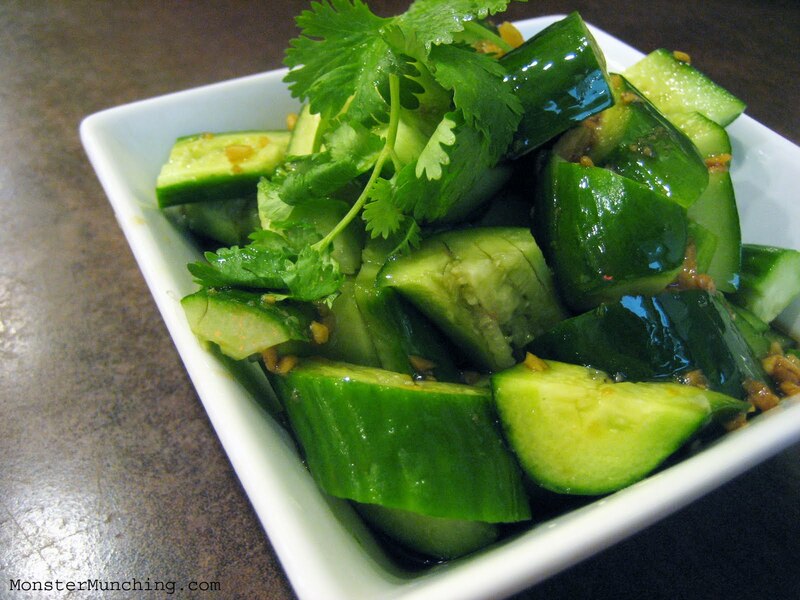 We started our meal with a simple, refreshing, bowl of cucumbers, brined in soy sauce, sesame oil and bits of garlic. It's one of those dishes that you bite into and spend the rest of the time trying to decipher the recipe. 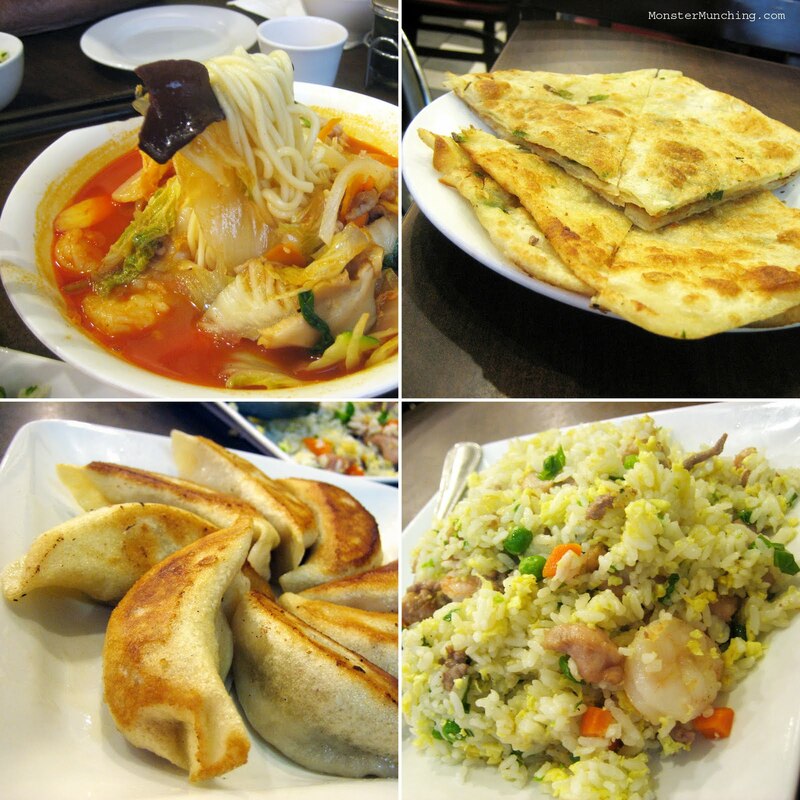 You conclude that you can make it at home, but realize you never will because, well, they do it so well here. For a main course, there was a combination fried rice--a mildly-flavored thing with egg, chicken, pork and shrimp that disintegrates upon contact with my mouth. I have to assume the dish owes its savoriness to MSG, which isn't necessarily a bad thing with me. And then there was the spicy seafood noodle, which I liked, even if the noodles seems too uniform, a tell-tale sign it was made elsewhere, probably in a noodle factory. The broth didn't seem as fiery, but it was just as complex as the dish should be, chock full of scored squid, shrimp, the slippery presence of a sea cucumber. As I slurped up the bowl, I wondered: we know what's happened with Ahnuld, but what about Noodle House's noodle guy? Turns out that the people who started New Golden City used to work at Earthen Restaurant (that you reviewed in '08: http://elmomonster.blogspot.com/2008/12/earthen-restaurant-hacienda-heights.html) and IMO, NGC's shangdong (山東）chicken is better than Earthen's. Their steamed dumplings are quite good though! Ahh, so that's the connection! I knew it was either familial or something like that. I love this place. So much better than Earthen (no lines AND they take credit cards). I think there's a few noodle dishes in there that you can ask for Hand cut noodles, or you used to be able to, I'm not so sure now. The server that used to work at the noodle place that is now Golden City works now at VIP Chinese which also makes a seafood noodle soup. The noodles soup is good, but man I really miss the one at the old noodle place. Anyone know if the owner/chef went to open another restaurant? Cool! Hand cut noodles! Thanks for the tip! I'd also like to know where that dude went! There's also a new place called Easy Earthen. It's a "fast food" version of Earthen, meaning all the food is served on plastic and can easily be packed to go. All are connected through family but NGC from what I heard at Easy Earthen doesn't have the "Earthen" name due to some issues.